Wash with a moisturizing shampoo. It’s important to use a shampoo that will strip your hair of dirt and oil without robbing it of essential moisture. Since the fall and winter tend to be drier months of the year, your hair can become stringy in the cold weather, which makes for more split ends. A shampoo that makes your hair feel smooth and sleek after washing is a must. 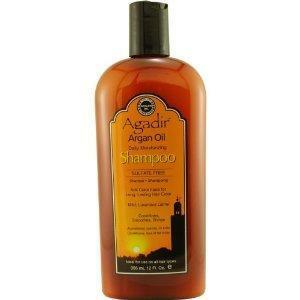 Products like Agadir Argan Oil Daily Moisturizing Shampoo are especially formulated for color-treated hair, and help to prevent frizziness. The shampoo gives your hair a pleasant fragrance, too. You can find it on websites like Soap.com for about $18.